Manchester United are reportedly interested in signing James Rodriquez and he may be available at £70 million. Liverpool are also interested in the South American playmaker, according to talkSPORT, which shouldn’t come as a surprise given their need to add some class to their midfield. 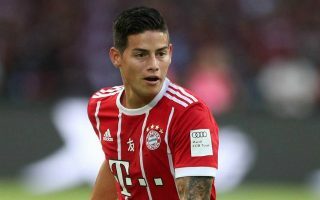 James is currently on loan at Bayern Munich, but The Mirror report that Real Madrid are looking to sell their player in the summer, and hope United’s supposed interest in the past still remains if the Bundesliga giants refuse to take up a £50 million option to sign him permanently before June 15. Spanish newspaper El Confidential says Real would raise their asking price to £70m if United or Liverpool were to make a move, leaving Bayern the chance to sign him for £20m cheaper. James doesn’t strike us as a player United *need* to make this season. If the FA Cup knockout against Wolves thought us anything it was to sign a quality right winger in the summer in order to become less predictable in attack and more potent. That doesn’t ignore the fact United also need to world-class centre-back after years of questionable defending. Even when we set up to be defensive under Jose Mourinho this season, the lack of quality at the back was clear. But since James burst onto the scene at the 2014 World Cup, has he met expectations? That’s up for debate even though there’s no denying his quality as a player. It will be telling if Bayern decide not to keep him after this season.